Tonight Vala returns to the fray and SG-1 causes more issues. At the SGC people are weirded out by Daniel acting strangely that morning only for it to be revealed that it’s Vala, still alive, controlling him via Ancient communication stones. It turns out that Vala is on a planet like the one she visited with Daniel earlier on that year. Vala begins to regale the team about what’s happened in the meantime since her disappearance, where she’d been taken in by a crippled man Tomin, and began to try and fit in as best as possible while trying to send word back to the SGC. To the disturbance of the group, who ask her to skip the dull parts of the story, she reveals that she’s somehow pregnant from an unknown cause and that Tomin, who it turns out she later married to cover it up, was fixed by the Priors who are busy conscripting all able-bodied men to serve in their armies of conquest. Landry is pulled away from the discussion to meet with Col. Chekov and the Chinese IOA representative Shen Xiaoyi who are effectively attempting to take control of the Stargate Program through the Russians ending their “loan” of the Alpha Gate. Landy eventually works out however that Chekov was deliberately trying to reveal the plans by the Russian and Chinese governments so that he could counter-offer to keep the current arrangements, which Chekov and others prefer, which involves giving the Russians the next BC-304 in production. Back to the Ori threat, while on the planet Vala came to the attention of the local fixer Seevis, who supplied the off the books incentives to the village to ensure continued devotion to the Ori, but also became friends with the “village harlot” Denya, who was really a member of the Anti-Ori Resistance. Eventually Seevis hears of this and has her punished by placing her without food and water on the ceremonial dias at the center of the village until she’d confess the identity of those who are members of the Resistance to him. Vala however refuses to break, only being set free when Tomin saves her after three days. After recovering from her ordeal Vala begins to spy on the Ori, who are building large spaceships in a canyon nearby, only to be surprised by Seevis who it turns out is the leader of the Anti-Ori Resistance and was planning to destroy the ships when launched via sabotage. Before the day of the sabotage a Prior visits the home of Tomin and Vala, revealing to Tomin that the child is not his but is in fact the will of the Ori themselves. On the day of the ceremony Vala asks Tomin not to go, saying she “has a bad feeling” about the day’s events. The planned sabotage however doesn’t work, with all the ships launching, leading to the use of the comms stones, which Seevis had recovered, being used to send the message. Before Vala can reveal more however Tomin arrives at Seevis’ bar and kills both members of the Anti-Ori Resistance but doesn’t kill Vala after she convinces him she’s innocent. At the SGC Landry gives permission for SG-1 to hunt down Merlin’s anti-ascended weapon while the rest of the base continues to search for another Supergate, which must exist for the Crusade to take place. Well that was a very meaty episode to get into wasn’t it. Two quite attention-grabbing plotlines with one involving the future of the SGC itself and the other the upcoming threat from the Ori. The main one of course is the latter, featuring the return of Vala who is now also pregnant by the will of the Gods themselves and for reasons we don’t really know. Instead of this being explained the episode is largely focusing on building up the Ori side of affairs over the last several months through her eyes. This could’ve been a fairly quick and simple exercise of her just listing what happened and then the team going to stop it on their end. Instead the show made the what turned out to be brilliant decision of widening the field by introducing a handful of new characters and fleshing them out to a significant degree from her perspective. The Anti-Ori Resistance, which was originally just “some guy” now has two very different members to it which shows just how wide-ranging it is/has become with it controlling key positions in society, as seen through Seevis. Seevis’ position means that other references to the wider network, such as agents in Celestis itself, become far more believable and accepting to the viewer as he represents that high-level aspect, while his ally Denya represents the more seedy on the ground element that makes it believable that construction crews could be persuaded into doing their bidding. On the flipside we also have Tomin, a devout believer in the Ori and also Vala’s husband, who is well-painted as the sympathetic face of those who are under their command. 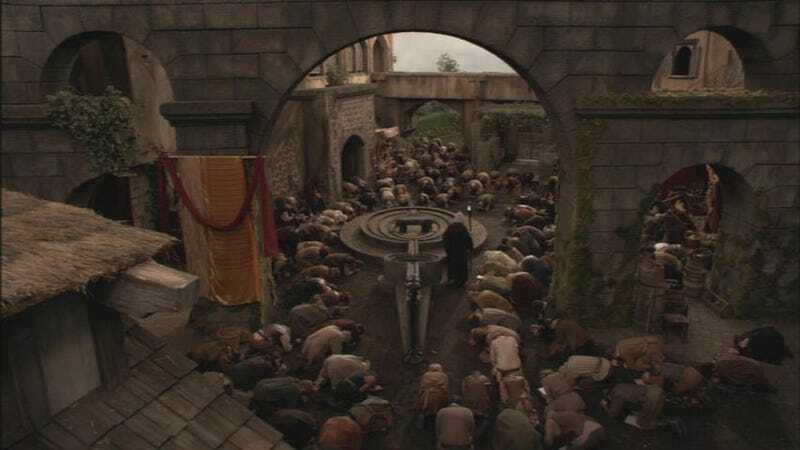 Until now we never see really why the followers of the Ori are like they are in their zealotry but here we see front and center why as unlike the Goa’uld these guys do perform quite literal “miracles” with their powers, such as healing the sick and crippled. It’s no wonder why they’d see anyone who doubted or went against the deliberately built up message of the Ori as saviours as being evil and sinners as their entire lives they’ve only really seen the “good side” of the Ori. Even when he kills Seevis and Denya at the end of the episode you still see him as sympathetic due to the fact he was following the orders of the Prior who only days earlier had fixed his leg and would understandably be loyal to him as a result. For the other main storyline of the episode we see that Earth politics continue to get in the way of the greater objective, with the Russians and Chinese wanting more control over the direction of the Program. These American-Russian standoffs were always fun in the earlier seasons of the show and they’re still fun now, with Chekov and Landry’s subtle machinations being the focus of it. Chekov’s relationship with the SGC has always been a unique one, with him publicly being the face of the Russian administration but privately trying to help the team out wherever possible over the years as long as it’s not a detriment to the Russian Armed Forces role on the base. In this case he deliberately gives Landry a way to keep the SGC operational without letting those from his own side know as he’s aware that US control of the Program is still the best way forward and that the Chinese holding the purse strings isn’t good news for anyone so gives Landry the tip off that the Russians will be placated as long as they get a spaceship of their own, even if it’s not fully finished right now. So that’s Crusade, an episode that continues the IOA-SGC troubles as well as building up more human faces for the Ori storyline that have been largely lacking up to now. The episode is clearly a set up for the finale but still stands on its own two feet in the meantime. · Real-life pregnancies really caused a lot of story rewrites this season. · Is Landry Trump because they say “China” similarly. Quote of the episode: “Yes and I’m absolutely terrified. Have any of you ever heard of anything like it? The team are off-world searching for Merlin’s weapon, coming across Ye Olde Medieval Village which contains a sword set in stone and the town mayor who confirms that they are in Camelot. While the village is initially welcoming they suddenly quiet when they ask about Merlin, who the village view as evil and see his rooms in the village as cursed. Mitchell however gains the trust of a couple of the kids in the village who show them to the sealed off rooms and are able to get in with the help of the village historian. Once inside the team don’t find much other than Merlin’s old notes until they find a hidden chamber which contains objects of an Ancient origin. While the team heads inside the village historian heads home, only to be killed by a Knight hologram. The next day the mayor demands that the team leave the village as a result of the death, believing it to be the curse, but the team believe that the Knight deliberately attacks those outside the library when opened to create the idea of the curse. Daniel attempts to explain this to the village, only to be beamed away to the Odyssey at that moment. On board they’re informed that they’ve found the Supergate and that a joint Tau’ri-Jaffa-Tok’ra force will attempt to destroy the Gate and stop any ships that attempt to make it through. While Teal’c and Carter go with the Odyssey Daniel and Mitchell stay behind in Camelot to look for Merlin’s weapon. In Camelot Daniel once again tries to use the Ancient device, only summoning the Knight into the village once more. Mitchell attempts to use his P90 and a sword on the Knight but neither seem to have an effect. The teenager in the village that Mitchell befriended however pulls the sword from the stone before passing it to Mitchell but he is unable to defeat the Knight in combat. Daniel however finally figures out the Ancient device and reveals Merlin’s treasures, before then destroying its power source which ends the Knight hologram for good. Daniel once again tries to explain the situation to the townspeople only to be beamed away again, this time by the Korolev. Meanwhile the Odyssey, soon joined by the Korolev, arrives at the Supergate, finding the Tok’ra and Jaffa forces already there. They’re soon joined by Asgard vessels as well along with forces from the Lucian Alliance that Teal’c was able to get to join them. Carter beams over to one of the Gate segments in an attempt to dial out the Gate before it’s dialled in, thereby stopping the Ori from arriving at all. Before she can complete her mission however the Ori dial in, sending the first wave of four Warships. The Allied force opens fire on the Ori ships doing little damage while the Ori retaliation does serious damaging, significantly draining Tau’ri and Asgard shields while cutting right through Ha’tak ones in one shot. The fight quickly turns into a slaughter for the allies, with nearly all the Ha’taks taken out and the Korolev going down with almost all hands. As the Ori vessels overlook the debris field we see that one carries Vala, who begins having contractions. Camelot is a tale that can be easily split in to two parts, the beginning that features yet another Medieval village and the other featuring the season’s final confrontation with the Ori. One is far, far better than the other. Let’s start with the weaker of the two shall we, the Medieval village. I can see where the episode was trying to go with this, with the whole Arthur and the Round Table angle once again but my word is the execution just bad. There is no other word for it. While the show has parodied or mocked other campy shows before this is one of the few moments of the show where I can’t help but feel it’s become what it mocked, especially that fight with the Knight towards the end. Yes, they avoided the obvious case of the girl pulling the sword and saving the day but that would’ve been far more fun to watch than whatever that was with this whole annoying season 9 pushing of Mitchell as this warrior type. At least it didn’t go so far as to have Mitchell be the one to defeat the Knight himself but for him to fail and have Daniel save the day instead. The storylines only redeeming features is the performance by Denethor himself John Noble as the village’s Mayor and the recurring gag of the team being beamed away just as Daniel tries to convince the village there’s no such thing as magic. The saving grace of the episode is the last few minutes with the climactic space battle between the Alliance forces and the Ori. This season has lacked in the action-packed department (Atlantis season two by contrast has had many action-scenes) and this makes up for a lot of that, with the return of the Asgards to the fight. While the Ori have been painted as this great threat all season through the Priors we now see their martial ability is also a grave danger, with their warships able to take out a far larger fleet without any real effort on their part. It’s just a bit of a shame it’s so condensed into such a small space, with items like Carter’s attempt to stop the Ori and the appearance of the Korolev squished together, but it’s memorable and exciting. Overall Camelot is an uneven season finale that in many regards doesn’t actually feel like one. It’s not perfect but it’s not offensive on the eyes either. · These village props are really starting to look old now. · SG-1 really need to stop creating their own problems and thinking they know best. · Mitchell resorting to the P90 as always.